Reviews from R'lyeh: What killed Dungeons & Dragons? It is difficult to approach 13th Age without a sense of hyperbole. In effect, Rob Heinsoo and Jonathon Tweet, respectively the designers of Dungeons & Dragons, Fourth Edition and Dungeons & Dragons, Third Edition have backstabbed their respective editions of Dungeons & Dragons, taken the corpses of both and revivified the choicest cuts with action and drama. Where Dungeons & Dragons – and most variants and retro-clones – are perhaps a little staid in their play style, 13th Age is a d20 System variant is written to be anything but that… It employs streamlined mechanics and choices in play to speed the play of the game and it employs mechanics that actively work to engage the player characters in both the setting and the story. In effect it takes the war game simulation origins of Dungeons & Dragons and sacrifices them on the altar of dramatic action and storytelling. Although it very much has the underlying architecture and many of the elements of the archetypal Dungeons & Dragons game, 13th Age is what would have happened if Dungeons & Dragons got its arse handed to itself by Feng Shui and its corpse was stamped on by Dungeon World. Hyperbole aside, 13th Age is a Dungeons & Dragons-style RPG unlike anything that that ‘style’ in gaming has ever seen. What it brings to Dungeons & Dragons are contemporary mechanics that encourage storytelling as part of the game’s play that combine the best features of the last two official versions of Dungeons & Dragons – and it does this before we have the next official version, D&D Next. Published by Pelgrane Press, better known for its GUMSHOE System family of games, including Trail of Cthulhu, Ashen Stars, and Night’s Black Agents, 13th Age just might be everyone’s next fantasy heartbreaker. At the heart of 13th Age are three core elements that change Dungeons & Dragons as we know it – Icons, “One Unique Thing”, and Backgrounds. The setting does not have gods as such, but thirteen Icons, each a being or personality that shapes part of world. They drive and direct the events of the world, and include the Archmage, the Crusader, the Diabolist, the Dwarf King, the Elf Queen, the Emperor, the Great Gold Wyrm, the High Druid, the Lich King, the Orc Lord, the Priestess, the Prince of Shadows, and the Three – the latter being ancient evil Dragons. In another setting they might be Sauron or Vecna, Elminster or Gandalf, Conan or Drizz’t Do’urden, Orcus or Tiamat, and so on, but either way, each player character has relationship with one, two, or three of the Icons. Each relationship can be Positive, Conflicted, or Negative depending upon how many points are assigned to it and will further vary depending upon if the Icon’s nature is Heroic, Ambiguous, or Villainous. Before each session each player will roll for his Icon relationships to see if one or more will somehow influence the events of the forthcoming session. As a player character progresses from First Level up to the maximum of Tenth Level, the strength of his Icon relationships will also grow, whether becoming an Icon’s champion, enemy, and so on, or indeed as is inferred by 13th Age, eventually supplanting the Icon. The question is, would such a change inaugurate the 14th Age? 13th Age forgoes traditional skills in favour of Backgrounds. Each Background is essentially a flexible package of skills represented by single catch all phrase or word. How each Background works or can be applied in each situation is determined by the agreement of both player and GM. For example, ‘Lady of the Emperor’s Court +4’ would indicate a person with an understanding of etiquette, a head for court politics and intrigues, and who possesses a certain status. Whereas ‘Bounty Hunter +5’ would be able to investigate where his target is, interrogate suspects, track his target, and so on. Of course, the Icons, the One Unique Things, and the Backgrounds are not the only changes in 13th Age when compared to Dungeons & Dragons, but these changes escalate aspects of the game and how it is played. They lie at the heart of characters in 13th Age. The game gives nine familiar choices for a character’s Race – Dwarves, Dark Elves, High Elves, Wood Elves, Gnomes, Half-Elves, Half-Orcs, Halflings, and Humans plus some further options if the GM wants to add them to his world. Each Race provides a bonus to one of two characteristics – the player’s choice, though the bonus cannot stack with the one gained from his chosen Class – and a Racial Power that a character can use once per battle. For example, a Dwarf has the choice of +2 Con or Wis and receives the Racial Power of ‘That’s Your Best Shot?’ which lets him heal as a Recovery free once per battle. Similarly, the choice of Classes available will be familiar, but each is different to the familiarity of Dungeons & Dragons. The differences are given up front in a Play Style section for each Class which describes how easy it is to play, who it would appeal to, and so on. Certain elements of each Class are optimised – Armour Class and choice of armour and weapons and choice of weapons for example. Thus the Rogue can wear any armour, but wearing heavy armour or wielding a shield imposes an attack penalty. His optimal choice of Armour is Light which gives him a base Armour Class of 12. The Rogue can use any weapon, but with Martial or Heavy weapons he again accrues an Attack Penalty, so small, light, or simple are a better option. What is interesting is that weapon damage is determined by how well the Class can use it, so that the Rogue is as deadly with his knives or his shortsword as a Fighter is with his longsword. In effect this is dramatic damage rather than simulationist and this only escalates because a character gets a damage die per Level. So a Third Level Rogue would roll not 1d8 for his knife attack damage, but 3d8! Every Class has its selection of Powers and Talents, many of which a player can enhance though his choice of Feats. Both Talents and their accompanying Feats come in three levels – Adventurer, Champion, and Epic – and barring the general Feats, every Feat serves to enhance one of a character’s Powers or Talents. The selection of Powers and Talents available varies in number and complexity from one Class to the next and 13th Age is again quite open about which Classes are more complex than others, from the simple Barbarian and Paladin Classes to the complex Bard and Wizard Classes. At the heart of each Class is a singular feature that only members of that Class can do in 13th Age. For example, the Barbarian can Rage once per day – more if certain Feats are selected – allowing him to roll two twenty-sided dice in combat and if both roll eleven plus and hit, then the attack is a Critical, while the Paladin can ‘Smite Evil’ several times a day to add more damage. In comparison, the Bard sings magical Songs that have initial effects, continuing effects, and a final effect when the song ends. For example, the Song of Spilt Blood levies a penalty against a Bard’s attackers equal to the number of his allies with greater Hit Points than the Bard when first sung and sustained, and then grants the Bard or an ally a heal using a Recovery when it is ended. The Wizard can of course cast arcane spells, whether that is Cantrips, Cyclic spells that can be cast from one battle to the next, and Ritual spells that can take hours to cast, but have a greater effect. The complexity of the Class comes in knowing when to cast what spell and in taking the right Talents and Feats to customise the Wizard according to the player’s design. Of the other Classes, the Cleric possesses Domains and can modify some of his spells for broad or power effect and the Fighter can use flexible attacks called Manoeuvres that are triggered under certain circumstances, the player selecting which one to be triggered. The Ranger focuses on Talents that might for example make him a better archer, an expert tracker, or give him an Animal Companion, whilst the Rogue has a Sneak Attack and Trap Sense as well as Momentum, which is gained and lost in battle and then spent to fuel the Class’ Powers. Lastly the Sorcerer gets spells, but can also re-use Breath Weapon spells over the course of a battle, chain spells to attack multiple opponents from round to round, and can Gather Power to cast double-strength spells, amongst other Powers. At first it might seem that in creating a character has a lack of choice when it comes to the selection of Talents and Powers, but 13th Age does not so much restrict a player’s choice as focus it, enabling a player to better define the character that he wants and what he wants his character to do. Feats: Barbarian Rage (Adventurer), That’s Your Best Shot? Although there is flexibility in designing a character within the limits of his Class, what 13th Age does not allow a character to do is Multi-Class. This is not a wholly slaying of a classic Dungeons & Dragons sacred cow, for a future supplement will give the rules for it, plus some Class’ Talents allow the Class to use certain aspects of another Class. For example, the Paladin can select one of the Domains from the Cleric Class, whilst the Sorcerer has access to lower Level Wizard’s spells. Combat in 13th Age is also streamlined and focused to speed up play. In addition to the simplified choice of weapons and armour per Class and the increased damage a character does as he rises in Level, a character also does damage when he misses – usually half damage, which means that a character is always doing something, just not always effectively! This works well when facing Mooks where their damage is listed as big block for all of them and as damage is done to their Hit Points, a Mook is lost from the pack. Range and position are also simplified; this by abstracting what would be a map in Dungeons & Dragons to three range bands – Engaged, Nearby, and Far Away. Characters are more freely allowed to move around the battlefield, with some Talents and Feats, such as the High Elves’ ‘Highblood Teleport’ Racial Power almost encouraging it. As well as simplifying combat, 13th Age also intensifies it with the Escalation Die. This is a six-sided die placed in the midst of the table on the second round of a combat. It is initially set at one and on each subsequent round it is increased by one until it reaches six. What the Escalation Die represents is the momentum of a battle, driving it forward to a climatic outcome. It can be de-escalated if the player characters do not really engage with the enemy, but as long as the Escalation Die keeps rising, the player characters receive a number of benefits from it. First, a player character always receives a bonus to his Attack roll equal to the value on the Escalation Die, but second, the Escalation Die can trigger certain Powers. For example, as a Barbarian, Fandor can Rage once per day, but because he has the Barbarian Rage Feat at Adventurer level, he can Rage for free if the Escalation Die is four or more – and this gets better if he takes the same Feat at Champion and Epic levels! 13th Age takes two approaches to magic. First it divides magic items into two types. One-use items that a character purchase, such as potions, oils, and runes, and ‘true’ magic items that are amazing and rare and therefore special. The latter are not only special, but like the intelligent swords of Dungeons & Dragons, actually have an influence over the wearer or user, particularly if the character wields too many items. For example, the Boots of Ferocious Charge has the quirk of “You like to start fights as much as you like to finish them”. Simply, a character can own and use one ‘true’ magic item per level. Beyond that and the character is in trouble… Second, just as each Class has a limited range of Talents to choose from, so all spell casters have a limited number of spells to choose from, but their spells get better at higher level as they learn to cast the higher Level versions rather than the lower ones. So at First Level, a Wizard can cast five First Level spells, and then six at Second Level, but at Third Level, he can cast three First Level spells and four Third Level spells. This progression continues as he rises from First to Tenth Level, so that at Tenth Level, he can cast three spells of Seventh Level and nine of Ninth Level. One effect of the limited number of spells available to the Wizard Class is that it loses a lot of the spells from Dungeons & Dragons that do not inflict damage, for example, Feather Fall, Hold Portal, and Levitate. What 13th Age does instead is amalgamate all of these spells into one single Utility Spell. This gives the Wizard access to a number of non-combat spells that grow with the Level of the caster and further, the Wizard chooses the effect that he wants when he casts the spell rather than when he takes the spell. Similarly, the Wizard’s cantrips and rituals are intended to be as versatile in their use, this being limited by the player’s imagination and the GM’s agreement. It should be noted though that the fact that the player characters can heal themselves with the use of Recoveries divorces 13th Age of the need to construct the player character party along traditional lines. No longer is there the need to have a party consist of a Cleric, a Fighter, a Thief (or Rogue), and a Wizard. Thus it also divorces it away from the obvious need to have four players or more in a party, so 13th Age has the capacity to work with smaller as well as larger groups. Another sacred cow that 13th Age sacrifices is Experience Points. Indeed, the authors’ opinions are that XP are better left to computer games! Instead, the characters should ‘Level Up’ when it is dramatically appropriate, plus they should each receive an Incremental Advance at the end of each successful session, such as a bonus to an attribute, a new Feat, or a new or altered Icon Relationship. Characters in 13th Age need something to fight and unsurprisingly, they come in the form of monsters. There are no surprises when it comes to the choice of monsters included and to be honest, there is no reason for there to be. The monsters are all very traditional – dragons, goblins, skeletons, what have you, but all are presented with the minimum of fuss and the minimum degree of detail. More detail would just have got in the way… Every monster though is associated with one of the Icons, which enables the GM to tailor his choice of monsters to the Icon Relationships selected by the players and to the Icon Relationships that come up in play. The sparse simplicity of the monster stats in 13th Age make them easy to use and customise as well as prepare for an adventure. The setting of 13th Age – The Dragon Empire, is given in broad swathes, leaving room aplenty for the GM to add his details. What is given in terms of setting tends towards the dynamic, for example, gladiatorial games regularly take place in the Dragon Empire’s capital, Axis, City of Swords, including a boardgame played with living pieces; there are numerous flying realms in the overworld above The Dragon Empire and demon-infested Hellholes transformed by the Diabolist that beg to be explored; and a ruined coastline of castles, cities, and villages that are regularly assaulted by tsunamis and inhuman aberrations coming in from the Iron Sea. What matters here is not the day-to-day lives of the natives of The Dragon Empire, but where the player characters can adventure. Rounding out 13th Age is an adventure, ‘Blood & Lightning’, which is specifically designed to introduce the players to Icon Relationships and combat 13th Age style. Physically, 13th Age is a full colour hard back, neatly illustrated and laid out. The writing style is again unlike any Dungeons & Dragons rulebook that you can think of; it is light, conversational, and throughout takes time to step away from the rules to talk directly not only to the GM, but also the players about various elements of the game. Further, where another rulebook would maintain a single voice, 13th Age allows both authors to speak about how each approaches each rule or how they run it in their campaigns. Overall, whilst you might not want this with every RPG, here it is engaging and often it gives a slight alternative to a given rule. One final, very pleasing touch is the combination of the index and the glossary into one and it is very effective, quickly recapping the rule and giving its page number elsewhere in the book. Given all of the hyperbole so far placed at the 13th Age’s feet, it is really quite difficult to identify issues that count against it, but in the interests of some semblance of balance, here goes… Whilst 13th Age is very much written for anyone who is familiar with Dungeons & Dragons and the d20 System, such that it is very easy for them to pick this game up and play, it does not serve those who are less familiar or even new to roleplaying as well. Primarily this shows in the lack of an example of character generation and in an example of play, though there is an example of combat given somewhat later in the book. Mechanically, it seems rather odd for a classic Dungeons & Dragons-style game not to include the Druid Class, especially given that one of the Icons is the High Druid. Another Class not present is the Monk, but this is less of an issue, and anyway, both Classes will be presented in a future supplement. That said, once the Monk is presented it would be nice to see it accompanied by some cinematic style rules or mechanics, perhaps in the Wuxia style, to reflect the Class’ Oriental origins; and if so accompanied, perhaps such rules could be expanded to cover the other Classes in 13th Age too? 13th Age can be best described as the first post Dungeons & Dragons, Fourth Edition ‘Dungeons & Dragons’-style RPG. It is a Dungeons & Dragons-style RPG that looks to contemporary sensibilities rather than looking back to 1974 and it does so in three primary ways. First, it takes account of the fact that most roleplayers have less time to play, offering optimised character design, easier encounter and monster design, and faster, much faster combat. Second, it takes account that in playing a roleplaying game we are telling stories, with the Icon Relationships that tie the characters to the setting and their use to improvise elements of the on-going story, and the use of the familiar advice to ‘Fail Forward’ and reinterpret a character’s near failure as a success with consequences. Third, the game wants the characters to be ‘great’, not necessarily to be heroic, but to have their moment in the spotlight, and this again is supported by the Icon Relationships as well as the mechanics that escalates both what each character is capable of and the challenges that he will face. The resulting combination of these three ways is a game that is AD&D – ‘Action Dungeons & Dragons’ or perhaps DD&D – ‘Dramatic Dungeons & Dragons’, but whatever you call it, in summing up 13th Age it is difficult to avoid the clichés; so I am not going to… Thus Dungeons & Dragons and its staid playing style is dead, because in taking the familiar architecture and elements of Dungeons & Dragons Pelgrane Press’ 13th Age not only makes them its own, it also energises fantasy roleplaying up to eleven. Great review. Looking forward to trying out the system. Thank you. If you like the system on the basis of the review, please let Pelgrane Press know. Been wanting an alternative to Pathfinder... this may be that. Yeah, this sounds really good and I've been off traditional fantasy gaming for years. Hell, I went off fantasy RPG decades ago! It seems like the designers have really thought about what makes a game fun (not drawn out combat that takes an entire session to cut through some low-level minsters) and you've made a good stab at painting the breadth of the system and why we should play it. Good work all round! Great review. I got involved late in the play-test, that convinced me to pre-order the book. Ran a 1shot for my weekly group, we now play this exclusively over any FRPG system. It has the right mixture of math crunch and focus on storytelling that everyone round the table is happy! I have been going over 13th Age, intrigued by the hype and at a loss to share in the excitement. It's a pretty book. No doubt about that, but let's have a look at it. Is there anything new in it? Let's face it, skillless skills have been around since Into the Labyrinth. I think that is the point. This game is different from other kinds of D&D. I have been playing D&D since I was a kid. I have played almost every edition. This game is very different from those. I was not a fan of 4th, did not hate it. Just wasn't the kind of D&D I enjoyed. This game has some of the same- I don't know what you would call it. It uses some of the same set-up as in 4th with the powers, but by no means is it anything like 4th. Gridless combat being the biggest difference. Every class in 13th Age feels different. Not all of them have "powers." Which is what I always felt people were talking about when they made the comparison to MMORPGs. They all play differently. As for Icons, they have nothing to do with how you act and decisions you make in the game. They are not a replacement for alignments. They are used as a way to show your connections to the game world. The book uses the traditional alignment system to show D&D players roughly how the Icons are viewed or act. It is only used as an example. Even then the Icon Relationships the PCs have may be less with the actual Icon and more with organizations and actions the Icon has a strong connection to. A lot of this stuff has been seen in other games, but not altogether in a single D&D game. Especially not one done like this. This game is very well put together and is dedicated to bringing aspects of narrative gaming to a D&D style game. They weren't trying to do something groundbreaking. They just wanted a more story based D20 fantasy game. If you don't like D20 fantasy, the game is not going to be for you, no matter what they did. Wow, it is really hard to get passed the obnoxiously ridiculous, biased hyperbolic BS in the first paragraph and find the parts where you tell me useful things about the game system. Have you considered just skipping to that? Because it just makes you like you have an axe to grind. Why is it neccessary? Guess what? I like 13th Age. I ran the hell out of it at GenCon. I also like D&D. Even D&D Next depending on the packet). I also like a whole a lot of other games. I can actually talk about the merits and flaws of different systems without having to put them on a scale of best to garbage. That's the sign of a good GM and someone who can communicate well. That first paragraph made me want to stop reading. It certainly doesn't make me expect any critical analysis or objective discussion. It also isn't doing the game any favors to draw a line and say "that is broken, this fixes it." All that does is alienate people who are capable of being fans of more than one thing. If you like the game, if you really want to sell it and tell people how awesome it is, you'd do a lot better without the divisive language and putting fanbases on the defenses. 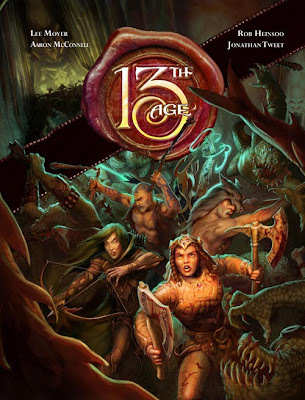 I appreciate that the review is not written in my usual style, but I wanted to write something that caught some of the energy of 13th Age and hightlighted many of the differences between 13th Age and other similar fantasy RPGs. Thus I was over the top in places by intent, something that I would not necessarily do with other reviews. It was never my intent to alienate yourself or any other reader, and whilst I can only apologise for that, I hope that you will understand when I cannot agree with many of the points raised in your comment. Lastly I do appreciate you taking the time to read the review and then comment upon it. I hope that you will take the time to read my other reviews, including the one of D&D Next that I plan to write.